I know that this costume has been done before, but it was probably my favorite of the entire show. The green base really made it work. As I walked away from taking the picture, I overheard some teenager say "it's one of the guys from Toy Story." Okay, buddy. This was a very strange addition to the show floor. This wheeled contraption was controlled by the guy we see here on the screen; he shuttled it from place to place via remote control. In front, a handler paved they way for the machine to move throughout the convention (presumably so attendees didn't just pick the thing up and run away). It seemed a bit disconcerting to more than just me, because it took a while to figure out if the guy on the screen was just a recording or if he was actually connected live. This made me wonder if he was promoting something (the product or a program?) or if this was some guy's way of circumventing the badge-buying process by wheeling himself around as a robot. In the end it just seemed like a guy with Google Glass and too much time on his hands. Overheard many times since: "Oh, they did something like this on The Big Bang Theory!" That damn show. While walking the convention floor, I saw a few people making a big deal about meeting the gentleman on the left of the above picture. Curiosity getting the better of me, I asked them just who they were getting their picture with, and they informed me that it was Lucas Till, who might be best known as Havok from the X-Men: First Class movie (also Hannah Montana). Lucas was kind enough to take a picture with me, and I apparently did my best to mess it up by looking stupid while snapping the photo. I don't know what the car is from, if anything, but I respect anyone who can maneuver this giant contraption through the aisles of Comic-Con. Ye olde Tick booth. I didn't take too many pictures from this location this time around, for no other reason than I didn't really think about it. Needless to say it was a very fun time. After the show let out on Thursday night, I went over to the Interactive Zone, where I got to sit in the Ninja Turtles pizza launcher (what fun!). Apparently I missed seeing Megan Fox and Will Arnett by only a few minutes. This is a shame, because I would have performed my chicken dance for GOB until we either became good friends or he had me forcibly removed. The pizza launcher really launched (fake) pizzas at stationary Shredder targets. You couldn't really see the targets from the top of the launcher, but it was a good time regardless. After the TMNT festivities concluded, I walked to Petco Park, where both the MTV party and Nerd HQ were located. The MTV party was unfortunately packed to the gills, to the point where the organizers weren't letting anyone else in until some of those inside left. Having waited in lines all throughout the convention itself, I thought it best to instead take in the Nerd HQ experience, and I'm glad I did. Of course, I had to climb up the side of the building to get in. 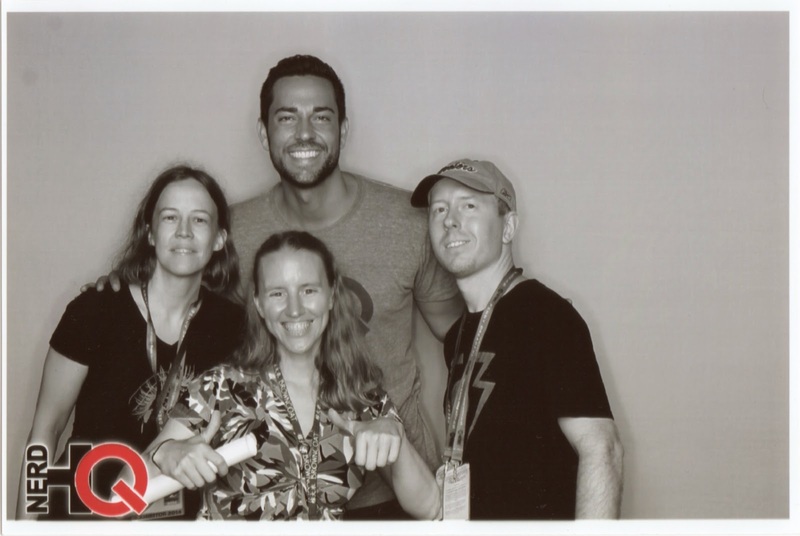 The timing was good, as we managed to catch Zach Levi (star of "Chuck" and the "Thor" sequel) at the Nerd HQ photo booth. Levi looks like a giant compared to the rest of us. He looks like a realistic robot that I could physically step into and control as a way of infiltrating secret Hollywood sects. He's also a pretty handsome dude. Also in this picture is Jennie Wood, she of Flutter and FUBAR fame! My name's on here somewhere. I found it at some point. Nerd HQ features a retro arcade, and here's a picture of Jennie working some Centipede magic. Nerd HQ was, as always, a whole lot of fun. We spent a few hours there playing games and dancing before heading out for the night. Levi throws a great party. We left just as the MTV party was letting out. I snuck in and saw some of the sights before being forced out. Here were a few other party goers. I also ran into a guy wearing a suit made out of stuffed animals (really) and asked to take a picture with him. Instead, he let me wear the jacket. It was the sweatiest thing I have ever worn. I don't really know what this is. Except that it is Comic-Con. Who's to say that these aren't the real guys? It's the same logic as robbin' a bank. That's it for Thursday of Comic-Con. Who wants to see more pictures? Well, you have to wait. What a shame. Spider-Man/Fantastic Four #2 original artwork by Mike Wieringo and Wade von Grawbadger! I found the page on the ComicArtFans website and I knew that I had to grab it. I've wanted to get a page of FF art by Wieringo for a number of years now, but they are increasingly difficult to find. I got this one at a fair price and it's something that I'll keep forever. Here's a little known story: I contacted Mike about drawing a cover to Teddy and the Yeti in 2007, just a week before he passed away quite suddenly. I have no idea if he would have been able to draw the cover (I'm not sure of his contractual status at the time) or even if he would have been willing, but it was such a shock to learn that he died at such a young age. At the time, I was looking at his website and through his pages of art for sale, and I found a point-of-view image of the Thing opening up his wallet from a recap page from his Fantastic Four run with Mark Waid that I remember so fondly. The page wasn't very expensive but I didn't buy it, and I've regretted that decision ever since. So to come upon this page was a nice surprise and I'm happy to check that purchase off my list. Wieringo's inker on his Fantastic Four run was Karl Kesel, and Kesel inked all of the story pages from blue line recreations, meaning that most of Wieringo's original FF art is pencil only. The Spider-Man and the Fantastic Four mini series, though, brought inker Wade von Grawbadger into the mix, and pencils and inks were done on the same page, which makes this an extra special treat. 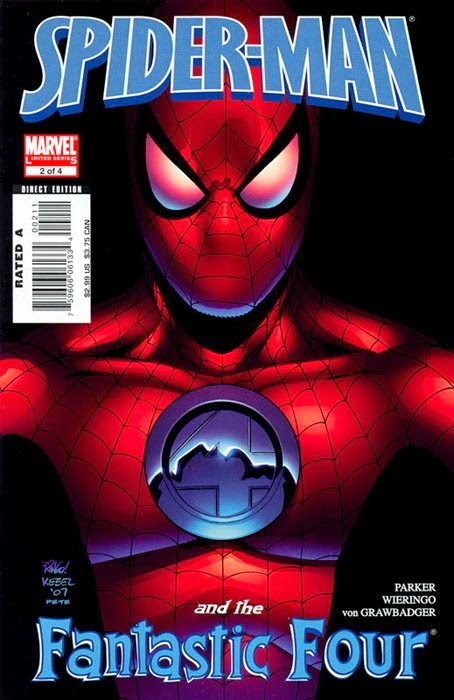 The page itself (21 of 22 in that issue) features the entire FF team plus some great shots of Spider-Man. The Thing is in four different panels, people!! But my favorite overall might be the shot of Reed and Sue hugging each other. The Waid/Wieringo run, more than most others, captured perfectly the loving relationship between these two stalwart Marvel characters, and it's well-represented on this page. And so my small collection of Fantastic Four original art grows by one. What a page to add, though. It's a real treasure of cosmic proportions. More pictures from Comic-Con? Celebrity pictures from Comic-Con? Why yes! This batch is the first from Thursday, 7/24...the first "official" day of the show. Just as I did in 2013, my first stop on Thursday morning was to Geek & Sundry, Felicia Day's gaming-themed event space. Unlike last year, the place was incredibly crowded, packed from front to back, for as long as I stuck around. This was a troubling theme for much of the show, one about which a solution is not readily apparent. Many of the expansion events - places outside of the convention hall - did not require visitors to have Comic-Con badges to enter and attend. At first this sounds like a great idea, one that spreads the wealth and allows more people to enjoy the events, especially if, say, they were able to get Comic-Con proper tickets on some days but not all of them. The result, though, was just an incredible crush of humanity. It was appreciably more crowded outside of the convention hall than the previous year and it was impossible to see many of the outside events. As a result, many attendees with tickets stayed inside, making the convention floor, especially on Friday and Saturday, more unbearable than usual. I'm not sure what the perfect answer is to this problem. I'm not even sure there is an answer to make everyone happy or at least satisfied. But having thousands more trying to fit into a relatively small space is not ideal by any means. I see no reason that Comic-Con can't continue to grow and admit more people to all of the great attractions, but there needs to be a tenable plan as opposed to trying to squeeze more into the same space. Who knows how this will all play out? But back to the point at hand. I really enjoy the idea behind Geek & Sundry and I'm always sad that I don't spend more time just hanging out. Comic-Con is all about prioritizing as there's always something to do, and crowds often make it difficult to even get to outside events, but this small space is well worth it and I'm going to try to give some more time to this particular location in years to come. Even though it was packed inside this year, it's still a low key event with appearances by none other than Felicia Day, she of Dr. Horrible fame. Here's a nice picture of the two of us. Here's me after I said "okay, we're gonna point at each other", and after Day probably said, to herself, "whatever, dude." But it's a fun picture nevertheless with a lovely and talented actress and gamer. After leaving Geek & Sundry, I made my way back to the interactive zone with one goal in mind: to score a slice of Pizza Hut's TMNT Pizza. The concept of free food has not lost its appeal and I was lucky enough to get some pizza before the line got too long or the exhibit ran out of food. The pizza, which was actually pretty good, came in this well designed box. I managed to grab some of the promotional posters for the Ninja Turtles movie as well. After I ate, it was time to get back to the convention center. Here's BMO from Adventure Time. And a pretty good Homer Simpson costume! The Red Woman texts during this Game of Thrones picture, but my favorite was, of course, King Robert's beard. Lady Shredder. Great costume. I wonder if she had to get the weapons on her arms approved before she got in...they were very realistic. I'm not quite sure why Captain America's shield is missing its red stripes. But this was a pretty decent Marvel ensemble, with '90s Cyclops, Cap, Jean Grey, Black Widow and Star-Lord. Pirate dog. Must have been a service dog of some sort to get in, or perhaps his costume fooled the convention floor workers. I probably enjoyed this new Captain Marvel costume more than any other at the convention. 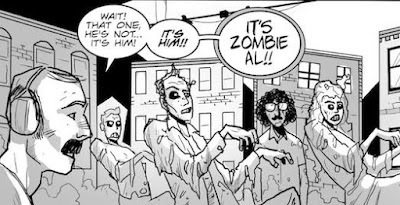 It's very book-specific and part of the comic book zeitgeist. He's probably gonna wreck it. Oh, it's the obligatory Comic-Con photo op from the escalator. I get one every year. While I was on said escalator, I saw these great Sherman and Mr. Peabody costumes. I suppose these were on display because of the recent movie, but it was fun to see these old time cartoon characters represented in 2014. See? I told you the eyes opened. I wonder what they do with this huge prop after the show ends. Yes, the eyes of this White Walker lit up. A very impressive prop in the media section of the convention floor. And let's end with a shot of Children's Hospital star/Daily Show alumni Rob Corddry. As I walked past and took this picture, I noticed that there were about two people waiting in line to get this actor's autograph. I looked around and said, "uh...is there a line for this?" and a security guard looked at me as if I was the biggest idiot at the convention. Okay, so it was a stupid question and I knew what the answer would be, but it never hurts to ask. OH WELL. Lots more to come. Please hold your anticipation in check. A few days ago, I was flipping through some issues of DC's 1989 Star Trek series when I came across an ad for the Overstreet comic book price guide. The ad made the bold claim that pristine copies of Superman #s 1-4, if they existed, could fetch $50,000 on the open market. I thought to myself that if I could go back to my eight-year-old self in '89, I'd probably give him the 50 grand to invest in those copies (I'd also probably go and see UHF in theaters while I was there). 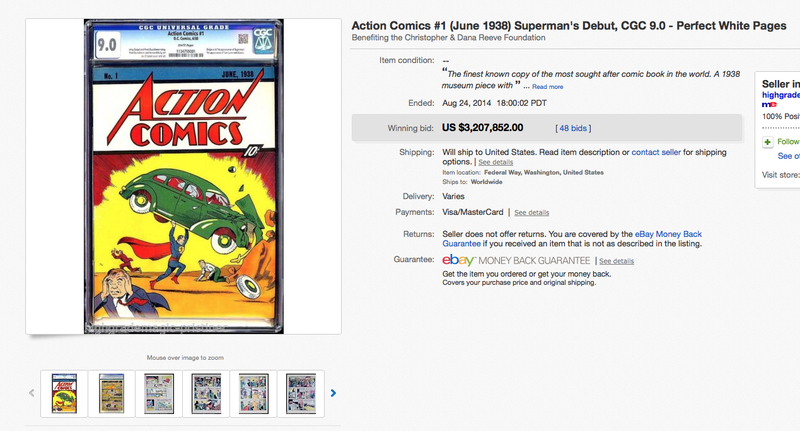 In light of the recent Action Comics eBay auction, it'd be money extremely well spent, as a beautiful copy of Action Comics #1 (probably the nicest copy in existence) just sold for a staggering $3.2 million plus. To be fair, this wasn't just any comic, and it wasn't just any copy of this particular comic. This is as close to the Holy Grail as you can get in this industry, and as we approach 80 years since its release, it's not like we're finding a whole lot more of these, or ones in better condition. Still, the price tag on this comic - and the escalation of prices on similar Golden Age comics as a result - is fairly astounding. Good for the multimillionaire or corporation that was able to add this to his/her/its collection. 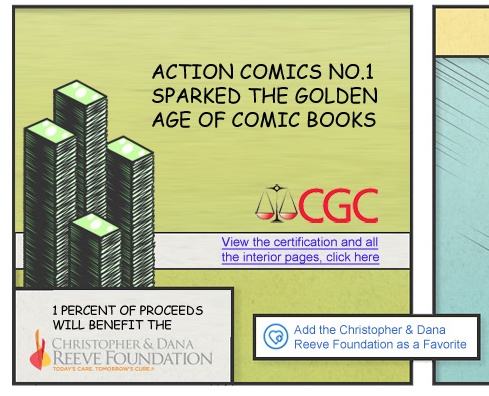 As you might expect for an item expected to fetch seven figures, eBay rolled out the red carpet and advertised this auction like few others before it, including creating a comic book-themed introductory page with the pertinent information and an embedded video with interviews and even a soundtrack. What I found a bit off-putting about this auction, to grumble just a bit, was the sense I got that the retailer selling it felt that he was somehow doing the world a favor by auctioning off this comic book treasure to the highest bidder. He spoke of the book with awe and reverence one might expect from someone who enjoyed comics, but put on the airs of someone who was donating a lost DiVinci piece to the Louvre while doing so. This is, of course, his right to do so and my reaction doesn't affect the nature of this one way or the other, but in some ways I would have appreciated it if we could have done away with the pretense and called, to turn a phrase, a spade a spade. The video embedded at the top of this post is from the auction. In it, the retailer discusses that a portion of the proceeds from this sale will go to the Christopher and Dana Reeve Foundation, a worthy cause and certainly appropriate given the subject matter. The fine print reveals that the portion is an entire one percent. Naturally, the retailer didn't have to give a dime to this foundation. But consider that eBay itself, just for lending the auction some server space, is going to get around 10 percent of the final value, a nice payday for those in charge. My biggest gripe, because I suppose that's all these are, would stem from when the retailer mentions that he'd love it if a museum would be the highest bidder, giving the public an opportunity to share in this treasure. A statement like that seems to be a bit disingenuous, because as incredible as this book may be, there's not a museum in the world that will pay over three million dollars for a comic, and more importantly, if he really wanted the book to land in a museum, he could have contacted one and sold it for a fair price. Of course, he didn't really want the book to go to a museum; he wanted it to go to the highest bidder. There's nothing wrong with wanting to sell something of this value with the intention of getting as much as you can for it. But have the guts to come out and say it rather than putting on a false veneer of altruism. Others seemed to jump on this gravy train soon afterwards, as eBay's "similar items" produced much more than I had expected for a book that has been out of circulation for 75 years. Just looking at the thumbnails for most of the featured items reveals that many of these are obvious reprints of Action Comics #1 from the last 25 years, a few of which I own. And yet there are price tags of over a hundred bucks on a few of these. Get it while you can, I guess.